I heard that incoming healing was bugged such that it acted like outgoing healing. I decided to test this. My results suggested that since p is low, null must go, or that we must accept the alternate hypothesis that incoming healing essence has no effect on outgoing healing. I took a stopwatch and spammed bolster courage on a volunteer for 3 minutes, clicking the bolster button roughly once a second. With 2.3 seconds on a bolster courage, this should have theoretically yielded around 60 heals. There's some skill lag after you're done casting each heal, and I got in a couple extra heals because it didn't just stop healing when I hit the timer, it finished that skill and then did the one that I'd queued up. I didn't count the heals, but it's well over 30 and should be enough to let us get a good statistical comparison. Then I loaded in a Dark Essence of Restoration (incoming healing), did the same, then loaded an Empowered Dark Essence of Restoration (incoming healing), did the same, then I parsed the numbers. Incoming healing, or Restoration, is not available from a Shadowed essence box. CombatAnalysis did jack diddely -- it parsed damage just fine but seemed to ignore all heals outside of "combat". So I logged my combat logs, loaded them up in Notepad, then did a find/replace (Ctrl+H) for "Tevye healed <volunteer>..." and all the like, leaving only numbers (with blank lines in between) then copy/pasted the entire log into single Excel columns. 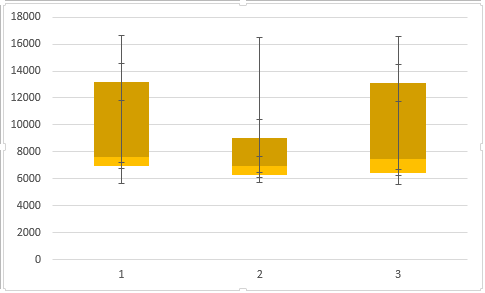 I then used the average/standard deviation formulas, and then the quartile formulas to build box/whisker plots. However, that 2nd test is quite a bit lower, and the average should be closer to the other two, so it's possible that I made a mistake somewhere. Or maybe my test subject (a guardian) did something different. Unfortunately, it's freakishly difficult to test essence because Standing Stone, well, I'm just going to stop there. Maybe I'll use a combat dummy next time and test for 20-30 minutes or something, but that'll have to wait for a day when I have more time. Tevye applied a critical heal with Bolster Courage to Thomaston restoring 13,392 points to Morale. Tevye applied a critical benefit with Bolster Courage on Thomaston. Tevye applied a heal with Bolster Courage to Thomaston restoring 7,331 points to Morale. Tevye applied a benefit with Bolster Courage on Thomaston. Tevye applied a heal with Bolster Courage to Thomaston restoring 5,961 points to Morale. Tevye applied a critical heal with Bolster Courage to Thomaston restoring 13,160 points to Morale. Tevye applied a heal with Bolster Courage to Thomaston restoring 7,335 points to Morale. Tevye applied a heal with Bolster Courage to Thomaston restoring 7,867 points to Morale. Tevye applied a heal with Bolster Courage to Thomaston restoring 7,590 points to Morale. Tevye applied a critical heal with Bolster Courage to Thomaston restoring 14,446 points to Morale. Tevye applied a heal with Bolster Courage to Thomaston restoring 7,948 points to Morale. Tevye applied a critical heal with Bolster Courage to Thomaston restoring 13,173 points to Morale. Tevye applied a critical heal with Bolster Courage to Thomaston restoring 14,785 points to Morale. Tevye applied a heal with Bolster Courage to Thomaston restoring 6,338 points to Morale. Tevye applied a critical heal with Bolster Courage to Thomaston restoring 16,412 points to Morale. Tevye applied a heal with Bolster Courage to Thomaston restoring 6,330 points to Morale. Tevye applied a heal with Bolster Courage to Thomaston restoring 5,673 points to Morale. Tevye applied a critical heal with Bolster Courage to Thomaston restoring 14,316 points to Morale. Tevye applied a critical heal with Bolster Courage to Thomaston restoring 13,103 points to Morale. Tevye applied a heal with Bolster Courage to Thomaston restoring 7,710 points to Morale. Tevye applied a heal with Bolster Courage to Thomaston restoring 7,859 points to Morale. Tevye applied a critical heal with Bolster Courage to Thomaston restoring 13,394 points to Morale. Tevye applied a heal with Bolster Courage to Thomaston restoring 7,617 points to Morale. Tevye applied a heal with Bolster Courage to Thomaston restoring 5,657 points to Morale. Tevye applied a heal with Bolster Courage to Thomaston restoring 6,478 points to Morale. Tevye applied a critical heal with Bolster Courage to Thomaston restoring 16,403 points to Morale. Tevye applied a critical heal with Bolster Courage to Thomaston restoring 12,716 points to Morale. Tevye applied a critical heal with Bolster Courage to Thomaston restoring 13,164 points to Morale. Tevye applied a heal with Bolster Courage to Thomaston restoring 6,979 points to Morale. Tevye applied a heal with Bolster Courage to Thomaston restoring 7,234 points to Morale. Tevye applied a heal with Bolster Courage to Thomaston restoring 5,712 points to Morale. Tevye applied a critical heal with Bolster Courage to Thomaston restoring 15,201 points to Morale. Tevye applied a heal with Bolster Courage to Thomaston restoring 6,773 points to Morale. Tevye applied a heal with Bolster Courage to Thomaston restoring 5,783 points to Morale. Tevye applied a critical heal with Bolster Courage to Thomaston restoring 16,620 points to Morale. Tevye applied a heal with Bolster Courage to Thomaston restoring 7,388 points to Morale. Tevye applied a heal with Bolster Courage to Thomaston restoring 7,552 points to Morale. Tevye applied a heal with Bolster Courage to Thomaston restoring 7,696 points to Morale. Tevye applied a heal with Bolster Courage to Thomaston restoring 7,292 points to Morale. Tevye applied a heal with Bolster Courage to Thomaston restoring 7,899 points to Morale. Tevye applied a critical heal with Bolster Courage to Thomaston restoring 12,775 points to Morale. Tevye applied a heal with Bolster Courage to Thomaston restoring 7,163 points to Morale. Tevye applied a heal with Bolster Courage to Thomaston restoring 6,953 points to Morale. Tevye applied a heal with Bolster Courage to Thomaston restoring 7,227 points to Morale. Tevye applied a heal with Bolster Courage to Thomaston restoring 7,349 points to Morale. Tevye applied a heal with Bolster Courage to Thomaston restoring 6,410 points to Morale. Tevye applied a heal with Bolster Courage to Thomaston restoring 7,738 points to Morale. Tevye applied a heal with Bolster Courage to Thomaston restoring 6,630 points to Morale. Tevye applied a heal with Bolster Courage to Thomaston restoring 6,220 points to Morale. Tevye applied a heal with Bolster Courage to Thomaston restoring 6,312 points to Morale. Tevye applied a heal with Bolster Courage to Thomaston restoring 6,114 points to Morale. Tevye applied a heal with Bolster Courage to Thomaston restoring 7,470 points to Morale. Tevye applied a critical heal with Bolster Courage to Thomaston restoring 12,183 points to Morale. Tevye applied a heal with Bolster Courage to Thomaston restoring 6,298 points to Morale. Tevye applied a heal with Bolster Courage to Thomaston restoring 7,484 points to Morale. Tevye applied a heal with Bolster Courage to Thomaston restoring 6,235 points to Morale. Tevye applied a heal with Bolster Courage to Thomaston restoring 5,688 points to Morale. Tevye applied a heal with Bolster Courage to Thomaston restoring 7,461 points to Morale. Tevye applied a heal with Bolster Courage to Thomaston restoring 6,757 points to Morale. Tevye applied a critical heal with Bolster Courage to Thomaston restoring 15,464 points to Morale. Tevye applied a heal with Bolster Courage to Thomaston restoring 7,957 points to Morale. Tevye applied a heal with Bolster Courage to Thomaston restoring 6,166 points to Morale. Tevye applied a critical heal with Bolster Courage to Thomaston restoring 13,496 points to Morale. Tevye applied a critical heal with Bolster Courage to Thomaston restoring 13,266 points to Morale. Tevye applied a critical heal with Bolster Courage to Thomaston restoring 12,647 points to Morale. Tevye applied a critical heal with Bolster Courage to Thomaston restoring 12,932 points to Morale. Tevye applied a heal with Bolster Courage to Thomaston restoring 6,285 points to Morale. Tevye applied a heal with Bolster Courage to Thomaston restoring 7,226 points to Morale. Tevye applied a heal with Bolster Courage to Thomaston restoring 5,741 points to Morale. Tevye applied a critical heal with Bolster Courage to Thomaston restoring 15,186 points to Morale. Tevye applied a heal with Bolster Courage to Thomaston restoring 6,527 points to Morale. Tevye applied a heal with Bolster Courage to Thomaston restoring 6,736 points to Morale. Tevye applied a heal with Bolster Courage to Thomaston restoring 5,751 points to Morale. Tevye applied a critical heal with Bolster Courage to Thomaston restoring 16,467 points to Morale. Tevye applied a heal with Bolster Courage to Thomaston restoring 7,660 points to Morale. Tevye applied a heal with Bolster Courage to Thomaston restoring 6,919 points to Morale. Tevye applied a critical heal with Bolster Courage to Thomaston restoring 16,185 points to Morale. Tevye applied a critical heal with Bolster Courage to Thomaston restoring 14,306 points to Morale. Tevye applied a heal with Bolster Courage to Thomaston restoring 7,024 points to Morale. Tevye applied a heal with Bolster Courage to Thomaston restoring 7,542 points to Morale. Tevye applied a heal with Bolster Courage to Thomaston restoring 6,481 points to Morale. Tevye applied a heal with Bolster Courage to Thomaston restoring 6,238 points to Morale. Tevye applied a heal with Bolster Courage to Thomaston restoring 6,130 points to Morale. Tevye applied a critical heal with Bolster Courage to Thomaston restoring 14,160 points to Morale. Tevye applied a heal with Bolster Courage to Thomaston restoring 6,602 points to Morale. Tevye applied a heal with Bolster Courage to Thomaston restoring 7,144 points to Morale. Tevye applied a heal with Bolster Courage to Thomaston restoring 7,348 points to Morale. Tevye applied a heal with Bolster Courage to Thomaston restoring 6,560 points to Morale. Tevye applied a heal with Bolster Courage to Thomaston restoring 5,953 points to Morale. Tevye applied a critical heal with Bolster Courage to Thomaston restoring 12,093 points to Morale. Tevye applied a heal with Bolster Courage to Thomaston restoring 7,138 points to Morale. Tevye applied a heal with Bolster Courage to Thomaston restoring 6,765 points to Morale. Tevye applied a critical heal with Bolster Courage to Thomaston restoring 15,962 points to Morale. Tevye applied a heal with Bolster Courage to Thomaston restoring 7,922 points to Morale. Tevye applied a critical heal with Bolster Courage to Thomaston restoring 16,139 points to Morale. Tevye applied a heal with Bolster Courage to Thomaston restoring 5,795 points to Morale. Tevye applied a critical heal with Bolster Courage to Thomaston restoring 13,383 points to Morale. Tevye applied a critical heal with Bolster Courage to Thomaston restoring 15,915 points to Morale. Tevye applied a heal with Bolster Courage to Thomaston restoring 7,397 points to Morale. Tevye applied a heal with Bolster Courage to Thomaston restoring 7,656 points to Morale. Tevye applied a critical heal with Bolster Courage to Thomaston restoring 14,598 points to Morale. Tevye applied a heal with Bolster Courage to Thomaston restoring 7,939 points to Morale. Tevye applied a heal with Bolster Courage to Thomaston restoring 6,413 points to Morale. Tevye applied a heal with Bolster Courage to Thomaston restoring 6,931 points to Morale. Tevye applied a heal with Bolster Courage to Thomaston restoring 6,222 points to Morale. Tevye applied a heal with Bolster Courage to Thomaston restoring 7,925 points to Morale. Tevye applied a heal with Bolster Courage to Thomaston restoring 7,402 points to Morale. Tevye applied a heal with Bolster Courage to Thomaston restoring 6,541 points to Morale. Tevye applied a heal with Bolster Courage to Thomaston restoring 5,911 points to Morale. Tevye applied a critical heal with Bolster Courage to Thomaston restoring 15,363 points to Morale. Tevye applied a heal with Bolster Courage to Thomaston restoring 5,896 points to Morale. Tevye applied a heal with Bolster Courage to Thomaston restoring 6,537 points to Morale. Tevye applied a critical heal with Bolster Courage to Thomaston restoring 12,887 points to Morale. Tevye applied a heal with Bolster Courage to Thomaston restoring 5,944 points to Morale. Tevye applied a critical heal with Bolster Courage to Thomaston restoring 12,415 points to Morale. Tevye applied a critical heal with Bolster Courage to Thomaston restoring 11,929 points to Morale. Tevye applied a heal with Bolster Courage to Thomaston restoring 7,522 points to Morale. Tevye applied a heal with Bolster Courage to Thomaston restoring 5,799 points to Morale. Tevye applied a heal with Bolster Courage to Thomaston restoring 7,480 points to Morale. Tevye applied a heal with Bolster Courage to Thomaston restoring 5,891 points to Morale. Tevye applied a heal with Bolster Courage to Thomaston restoring 5,722 points to Morale. Tevye applied a heal with Bolster Courage to Thomaston restoring 6,899 points to Morale. Tevye applied a critical heal with Bolster Courage to Thomaston restoring 16,569 points to Morale. Tevye applied a heal with Bolster Courage to Thomaston restoring 5,609 points to Morale. Tevye applied a heal with Bolster Courage to Thomaston restoring 6,399 points to Morale. Tevye applied a heal with Bolster Courage to Thomaston restoring 6,961 points to Morale. Tevye applied a heal with Bolster Courage to Thomaston restoring 6,480 points to Morale. Tevye applied a critical heal with Bolster Courage to Thomaston restoring 16,597 points to Morale. Tevye applied a critical heal with Bolster Courage to Thomaston restoring 15,596 points to Morale. Tevye applied a critical heal with Bolster Courage to Thomaston restoring 13,889 points to Morale. Tevye applied a critical heal with Bolster Courage to Thomaston restoring 12,010 points to Morale. Tevye applied a critical heal with Bolster Courage to Thomaston restoring 13,279 points to Morale. Last edited by Banaticus; Aug 25 2017 at 03:03 AM. 2017: 6 levels and an instance! As a level 1 burglar, Bilbo got a pony when he joined the Smaug The Dragon raid. Then he asked for leadership, looted the chest, assigned himself the 1st age Arkenstone and mailed it to an alt (Bilbo's a VIP so can mail from anywhere). They did some PvMP and an Epic Battle, then he apologized and gave the Arkenstone back because it wasn't BoA. He kept the pony. The standard deviation of the average (which is what you need to determine whether the averages are different) is the standard deviation of the samples (which you quoted) divided by the square root of the number of casts per sample. Because the variation from heal to heal (the standard deviation of the samples) is large, you need a lot more than 30-60 casts to see the effect of one essence. Based on what you say (30 - 60 casts per sample), the standard deviation of your averages should be roughly 500. The standard deviation of the difference between the averages of two samples would then be roughly 700 - which is comparable to the observed differences. I have checked the tooltips, and the tooltips appear to agree with the expected values if Tactical Mastery and Outgoing Healing work as described in the wiki. So the question is whether the actual heals agree with what the tooltips say. From some tests I did on my LM, the values in the combat log fell within the range of the tooltips, and approached the endpoints as expected. No, it would affect all heals equally, exacerbating the differences, so instead of looking at 50 and 60 (difference of 10), we might be looking at 55 and 65 (difference of 11). Incoming healing on the target should make it easier to spot a difference, although we would then have to calculate how much of the effect was due to incoming healing. Next time I'll just use a target dummy and collect a larger sample. No, it would affect all heals equally, exacerbating the differences, so instead of looking at 50 and 60 (difference of 10), we might be looking at 55 and 65 (difference of 11). If the target has +Incoming healing, the values in the combat log will not agree with the tooltips even if everything is working as it should. You want to see a difference of about 500, which means, for a conclusive test, the statistical uncertainty on your measured difference should not be much more than 100. That means the standard deviations of your measured averages should be no more than 100/sqrt(2) = 70. With each population having a standard deviation of ~3600, you would need about 2600 non-crit heals in each sample to achieve that level of precision on the averages. Of course, you could make life easier to magnifying the difference and using multiple essences instead of one. If you were looking for a 10% difference instead of 5%, you could get away with "only" ~650 non-crit heals in each average instead of 2600, etc. I have tested and again asked around. It turns out that Outgoing Healing is Working As Intended (WAI) but does very little to increase Outgoing Healing. Incoming Healing is not working like Outgoing, it is increasing your own survivability. I have made corrections to my write-up. I did some math to check whether my suggestion of using the average of minimum and maximum values gives a smaller variance than averaging the whole sample. It does, biggly. This is a special feature of uniform probability distributions. For a uniform distribution on [0,1], the standard deviation is 1/sqrt(12) ~ 0.289. If you average N values drawn from a uniform distribution on [0,1], the standard deviation of the mean will be 1/sqrt(12 * N). Instead, suppose we only record the minimum and maximum values drawn from the same distribution and average *those*. In this case, it can be shown (I won't go through the math here) that the standard deviation of this average, if we draw N values, is 1/sqrt(2 N^2 + 6 N + 4). This is a huge improvement because for large N, the standard deviation decreases as 1/N instead of 1/sqrt(N). For 20 measurements, the standard deviation of the average of all 20 values is 1/sqrt(12 * 20) ~ 0.065. The standard deviation of the average of the minimum and maximum values for the same 20 measurements is 1/sqrt(800+120+4) ~ 0.033. And the improvement gets bigger the more measurements you do. With 100 measurements, the standard deviation of the arithmetic average only improves to 0.0289, while the average of minimum and maximum has a standard deviation of 0.007. For testing heals, where the range is not [0,1], the numbers quoted are relative to the spread between minimum and maximum tooltip values. What do you mean "very little"? Outgoing Healing Rating is equal to Tactical Mastery, point-for-point, in terms of increasing your Outgoing Healing (but it doesn't increase your damage at all). I have tested this. Items are generally itemized to have significantly more Outgoing Healing Rating due to this limitation, since you would always prefer Tactical Mastery to an *equal* amount of Outgoing Healing. Notice that my Will (2612) and Tactical Mastery Rating (29311) are exactly equal in the two screenshots. However, from the gear, you can see that I have 17.3K additional Outgoing Healing in the second screenshot, and this increases my healing bonus from 23.9% (in the Tactical Mastery tooltip of the first shot) to 34.0% (in the tooltip of the second). This in turn increases the size of my heal (Beacon of Hope) by the corresponding amount. In the first screenshot, the maximum value is 3459. In the second, the maximum value is 3742. So the bonus from Outgoing Healing Rating is applied correctly. The minimum values agree similarly. The tooltip says it is a big improvement, is it also in actuality? I found a fourth pair of items with/without Outgoing Healing Rating, and I added a Shadowed Essence of Healing to the neckpiece. The effect is to make the difference larger and easier to test. In both setups, my Will and Tactical Mastery are identical, but in the second, I also have 30,187 Outgoing Healing Rating. The effect (in the tooltips) is to raise my Outgoing Healing bonus from 25.7% to 41.5%. And the tooltips for my Heals reflect that appropriately. Out of 100 non-crit heals, none fell outside the range of the tooltips, and as you can see, the full range of the tooltips was covered, as expected. By using the midpoint of the range, as I explained in an earlier post, we can very accurately compare with tooltips even with a modest number (50) of casts. I hope this will put to rest, once and for all, the myth that there is something wrong with Outgoing Healing Rating as a stat. Your outgoing healing is less than 30% -- that's pretty small. I'd be looking for at least double that. Edit: I should say, you're not really going to see a big improvement from that, but given how poor healing is now you're still going to need at least double what you have now. I believe I'm up around 70%. Hmm, isn't 70% the max rating? Without any buffs?? I'm sure if you healed that guard with that amount of outgoing healing percentage, then one or two essences more wouldn't make any noticeable difference. As always, percentage bonuses are not subject to the caps on ratings.